Slab leaks are a serious problem. When homes and places of business are constructed in Orange County, often the builders will set the main plumbing lines in the concrete foundation, or underneath it. Various events can shake these lines, such as earthquakes, excess pressure, or subsequent construction. 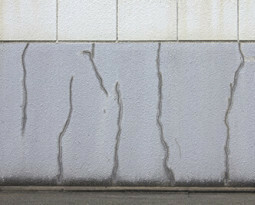 Sometimes these forces can create small ruptures or cracks in the lines. When that happens, water will seep into the concrete, and drain into the lowest point in the foundation that isn’t air-tight. Slab leaks are very difficult to detect, not only because the breach is underneath concrete and out of sight; also the water tends to appear in an area far from where the breach is located. Left untreated, the problem can undermine the integrity of the foundation, cause the wood to rot, or ruin floors and drywall. Mold can develop quickly and if untreated, can become a health hazard. If the breach is in a sewer line, then it is not water flooding the structure, but sewage, and such contamination will result in bacteria and insect infestation. Once you approve for us to begin work on the project, we will immediately access the source of the leak, and fix it – permanently. Our certified technicians will do this with the utmost respect for your home or place of business; we understand that this is your property. We wouldn’t leave our own home in disarray after a major repair, so we certainly wouldn’t do that to our Orange County clients. We care about you, and we are grateful for your business. The second part of the project is disinfection: if there is moisture, sewage, bacteria, mold, or anything else that could cause trouble going forward, we will find it and clean it up. This process requires a keen eye for detail – if you ask the wrong person to fix your slab leak, he might fix it. But if he fails to clean up the mess, you could end up with a repair that is even more significant than the slab leak, or worse – you could end up with a condemned building. The professionals at Knight’s Plumbing have extensive experience with the cleanup phase. You can count on us. For years, builders in Orange County have used a similar trend in setting plumbing lines inside of concrete foundations. We at Knight’s Plumbing have spent decades fixing slab leaks in structures like these. When you call us to come and fix a slab leak, you can count on a professional team who will get right to work detecting your leak. We will not be intimidated; we’ve seen it all. Our experts will make use of state of the art electronic equipment to locate the breach precisely. We can even locate a hole the size of a pin. This step is critical not only for minimizing the amount of damage done in accessing the leak; it also tells us what kind of line was punctured, and therefore what kind of cleanup will be necessary, and the extent of the damage. 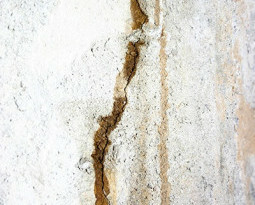 Sometimes slab leaks can create visible cracks in the foundation that leak water, though sometimes not. If you discover moisture on the floor or carpet, a hot floor, buckled wood, or mold, call us immediately. Slab leaks can also result in all manner of strange sounds. Pressure can create pings or squeaks in your pipes; these are further indications that you may need a professional to come and check things out. 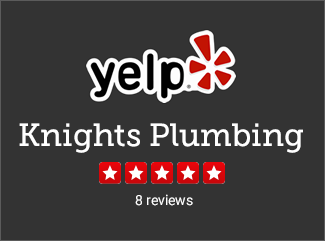 Knight’s Plumbing is available 24 hours, seven days a week, and we will respond quickly and professionally, no matter where you live in Orange County. After giving you a thorough diagnosis, we will give you a flat rate quote for the appropriate service that needs to be performed. We respect your time, and promise to be realistic about what is necessary to fix the problem. We want to return your property to you as good as it was before the problem occurred; we will settle for nothing less. If fixing a slab leak sounds expensive, keep in mind that most homeowner’s insurance policies have provisions for fixing them. Just by reaching out to us, we can take a lot of the fear out of this process for you. At Knight’s, we understand that plumbing emergencies are never convenient. But we are available any time, day or night. When you see a plumbing emergency, call us. Once we assess the situation, we can arrive at a plan that best suits your needs. Knight’s Plumbing understands that plumbing expenses are never planned, nor convenient. We have established our good name in Orange County by being consistent, reliable and having the low rates. Because we are good at what we do, we can offer one low, flat rate for our service, and we will always stand behind our work. We are confident that we can help you, no matter what the problem is!